Biking is a good way to burn fat and tone the muscles in your legs. 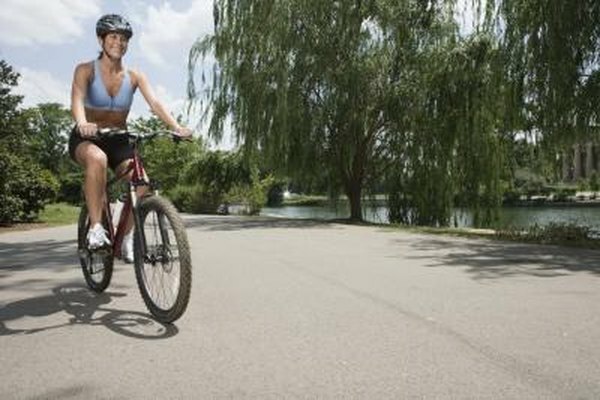 The necessary length of your bike ride will depend on several factors, including your weight-loss goals, what type of equipment you use and how fast you are riding. Consult with your doctor before you begin a weight-loss regimen, and create a routine that complements your biking and weight-loss goals. Before you determine how long you need to bike, set some weight-loss goals. A loss of one pound of fat requires you to burn 3,500 calories, so if you want to lose one pound each week, you will need to burn 500 calories a day. The best way to do this is to combine diet and exercise to create your daily caloric deficit. For example, you can cut 300 calories from your diet and then bike to burn 200 calories a day. Figuring out how quickly you want to lose weight can help you determine how many calories you want to burn by biking and, in turn, how long your bike ride needs to be. Different types of biking provide different benefits, and you should select the one that is best for your fitness level and goals. You may choose to work out on a stationary bike at the gym, which will allow you to exercise even in inclement weather, as well as help you monitor your speed more accurately. Riding a recumbent bike will support your low back, which may be beneficial to those with back pain or who are new to exercise. Hop on your bike and go for a ride outdoors, which will allow you to get some fresh air and vary your route to avoid growing bored. Adjust the length and speed of your routine for your ideal calorie burn. For example, a 155-pound person can burn 260 calories by riding a stationary bike at a moderate pace for 30 minutes. If she increases to a vigorous pace, she could burn 391 calories in the same amount of time. That same person could perform a half-hour of mountain biking and burn 316 calories, or bike on paved roads at a speed of 16 to 19 mph to burn 446 calories in 30 minutes. No matter what type of biking you choose to do, aim to get in at least a half hour of moderately paced physical activity in each workout session. You might also consider varying your routine to include other types of aerobic workouts, like swimming or dancing, to avoid overworking your muscles by doing the same thing day after day. Incorporating strength training into your week can also help build your muscles and improve your stamina for bike rides.